The following are some Frequently Asked Questions on Ahsay Cloud Backup Suite. How do I perform a backup to a local destination then import the data onto a cloud storage destination (e.g. seed load)? How do I start AhsayOBM in 32bit mode (to create an Exchange mail level backup set or to start a mail level backup job)? How do I start a data integrity check for backup data stored in the backup destination? Backup account profiles are stored in a new format, can you explain on the new changes? Backup data are stored in new structure, can you explain on the new changes? Can backup accounts of version 6.x be migrated to version 7.3 or above? Which version of Java is bundled with AhsayCBS (Cloud Backup Suite)? Cannot install AhsayACB on a Windows server operating system, why? Can I create multiple backup sets for my AhsayACB account? Retained data are not cleared according to the retention policy configured? Can I deploy an unofficial hotfix or a custom version to AhsayOBM / ACB clients using the Auto Update Agent (AUA)? Can I modify settings of the system routine jobs (e.g. enable / disable, start time, job specific settings)? Answer) Starting from AhsayOBM version 7.3, you can simply start AhsayOBM as you would normally (e.g. double-clicking on the desktop icon or the system tray icon), when creating a MS Exchange mail level backup set or performing a manual MS Exchange mail level backup job. Answer) In previous versions of AhsayOBS, user profile of each backup account is saved individually within the user home path of each account. This file contains the settings of all backup accounts, as well as settings of all backup sets. This file contain information of the corresponding backup account, backup sets' setting, and most importantly, the encryption setting of all backup sets. Answer) The indexing and file structure of backup data was redesigned for AhsayCBS (Cloud Backup Suite) version 7. Disadvantage of such indexing system is that, as all data of each account are indexed with only 2 files, the possibility of multiple processes (e.g. replication, rebuild, backup, restore) accessing the same index file increase. 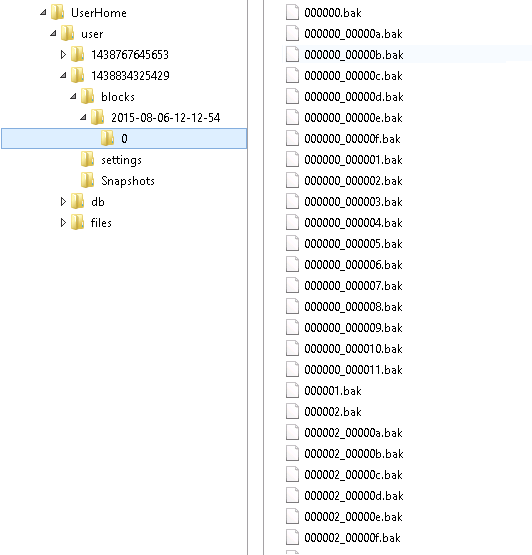 This can potentially be a problem for backup set with a huge number of files, as each file is compressed, encrypted, and uploaded individually (even for a tiny file), creating a huge overhead, that slow down a backup significantly. Changes were made to the file structure in an attempt to improve the backup and restore performance. Accounts' setting and backup sets' setting are no longer saved within each account's user home path (e.g. as 'Profile.xml' in previous version). They are now saved in a single location within AhsayOBS's installation directory (refer to the previous Q & A for details). Only user logs, backup client logs, backup reports, and other individual account's information, such as account storage logs are saved within the 'db' folder. Information on backup sets' type (e.g. file, system state type ... etc.) 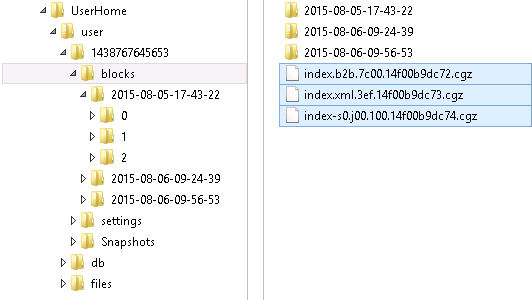 are saved under the 'files' folder within each backup set's respective backup set ID folder, in the 'info.xml' file. %backup_destination% can be AhsayOBS server's user home, a local storage, or a cloud storage destination. A new folder is created for each backup job according to its start time (YYYY-MM-DD-hh-mm-ss), under the 'blocks' folder. All files backed up by that job will be stored under that particular folder. For changes that occurs on the client computer (e.g. 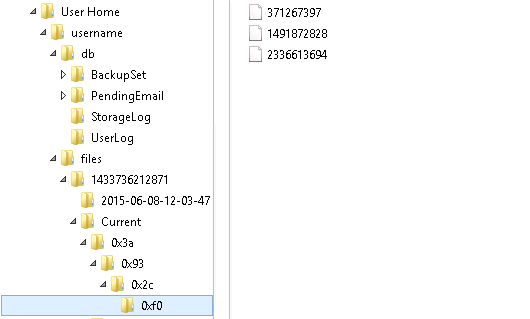 moved files, updated files), files are not moved within the backup destination (e.g. AhsayOBS, local destination, cloud service destination) across different directories, across the 'Current' and 'Retention' directories as in the previous file structure. Instead, the index files would be updated to reflect the changes, reducing the I/O operation on the backup destination. 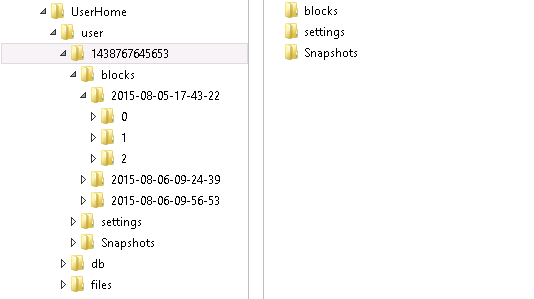 When the number of block files within '0' reaches 8192, a new folder is created (folder name increment of 1), restricting the maximum number of files within each folder. Source files that are 16 MB or smaller are 'combined' into a single 16 MB 'block' file before they are transferred to the backup destination (e.g. AhsayOBS, local destination, cloud service destination), reducing the overhead during the upload. This also reduces the number of files in the backup destination. Source files that are larger than 16 MB will be split up into multiple 32 MB 'block' files when transferred to the backup destination. An advantage of this design is that, for an upload that was interrupted by temporarily network issue, only the individual 'block' file would be re-uploaded (block which failed to upload), instead of the entire file. The 'settings' folder contain the encryption settings of the backup set (if the Encryption Recovery option is enabled by the backup user). 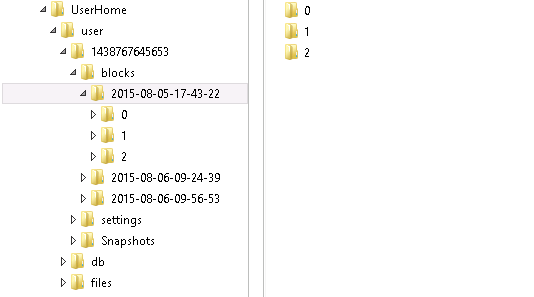 While, the 'Snapshots' folder is there for the replication module. If replication is enabled, during RESYNC or REPLAY mode, changes to the account will be saved in the 'Snapshots' folder, to be replicated. Answer) AhsayCBS version 7.5.0.0 or above, fully support the migration of v6 backup accounts and backup set is fully supported as well as v6 AhsayOBM / AhsayACB clients. The data structure of existing backed up data will remain the same (for AhsayCBS version 7.5), or the data structure can be migrated to the new format (for AhsayCBS version 7.7 or above). AhsayCBS version 7.3.2.0 does not support v6 AhsayOBM / AhsayACB clients. Answer) AhsayCBS is bundled with Java version 1.7 update 76. Answer) Starting from version 7.3.2.0, AhsayACB can only be installed on Windows 'desktop' operating system, such as Windows 7, 8 or 8.1 ... etc. Answer) The retained data within the backup destination may not be cleared because the retention policy job is not enabled for the backup set. Starting from version 7.3.2.0, the retention policy job (job for clearing retained data) is now enabled via the AhsayOBM / ACB client application. Login to the client user interface, select 'Backup'. 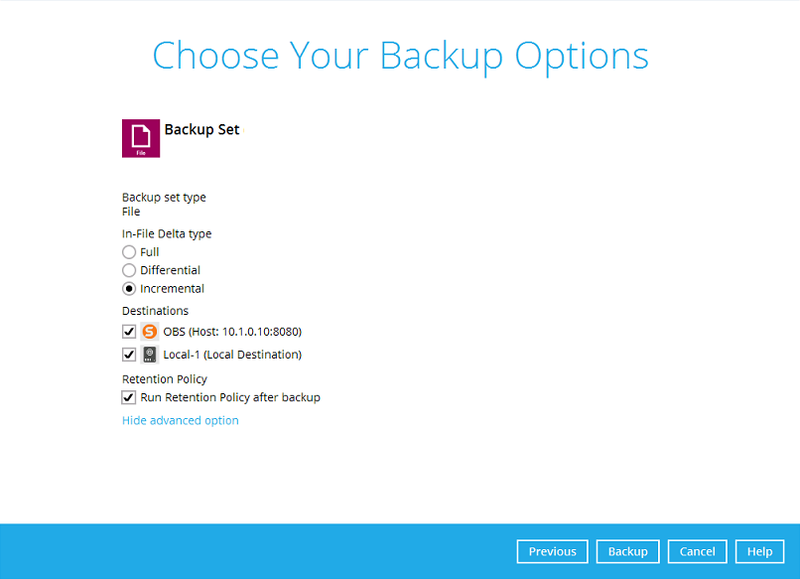 Select the corresponding backup set, then select 'Show advanced options'. 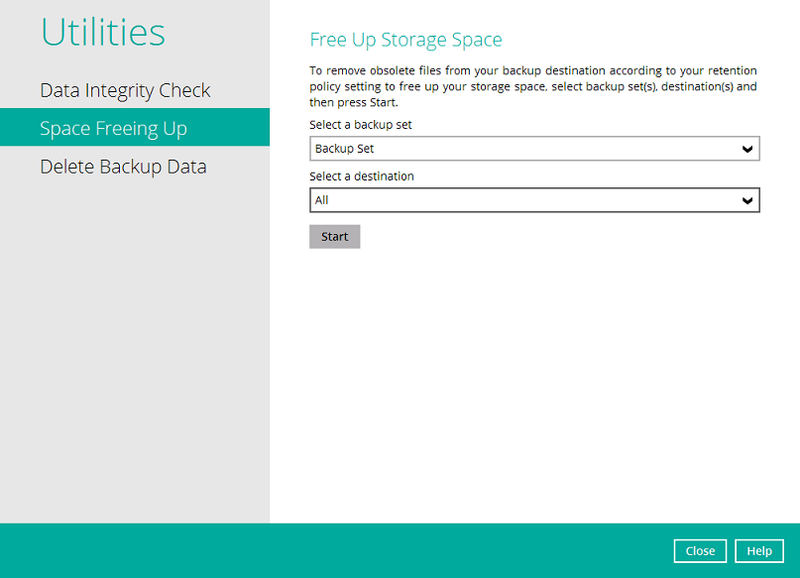 Under Retention Policy, enable the checkbox 'Run Retention Policy after backup'. Login to the client user interface, select 'Backup Sets'. 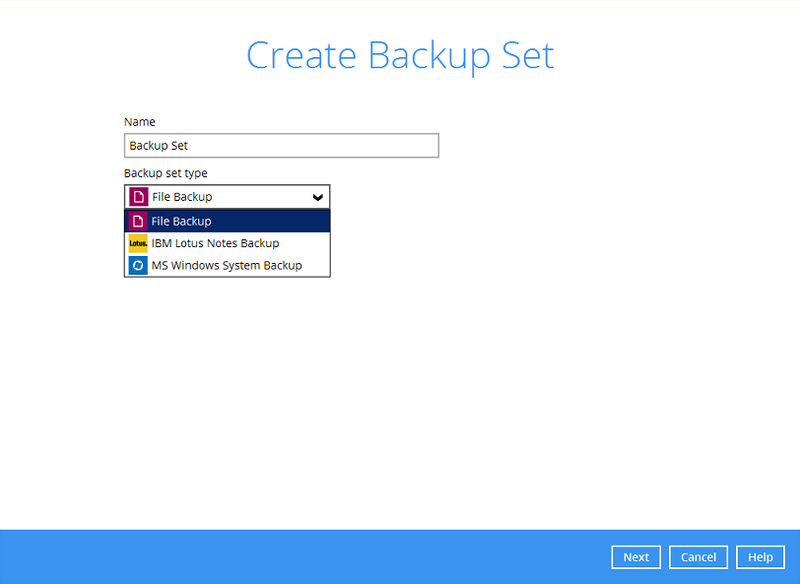 Select the corresponding backup set, then select 'Backup Schedule'. 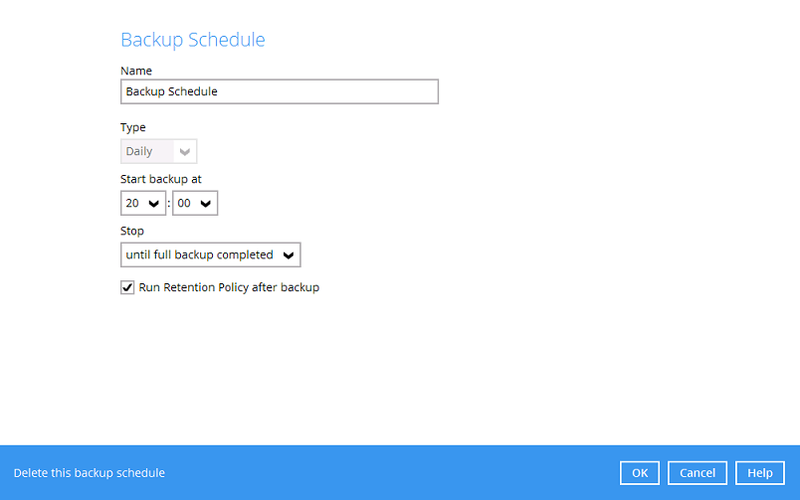 Configure the existing schedule, or create a new backup schedule, enable the checkbox 'Run Retention Policy after backup'. The retention policy job will be performed when the manual or a scheduled backup job is completed. Login to the client user interface, select 'Utilities'. Select the corresponding backup set, then select the backup destination location (e.g. OBS, local storage). Click the 'Start' button to start the retention policy job. Answer) No, it is not possible to deploy an unofficial hotfix or a custom version to AhsayOBM / ACB clients with AUA. Answer) No, it is not possible to modify settings of any system routine jobs. All system routine jobs are performed according to their schedules and cannot be disabled. System job to check on backup set triggered to start. System job sending restore job report to users with restore job completed in the past 15 minutes. System job logging storage usage statistic. System job sending setting change report to user. System job sending backup job report to users with backup job completed in the past 15 minutes. System job for sending inactive user report to administrator. System job sending missed backup job reminder to user. System job performing license check (for the redirector module). System job performing license expiration check. System job sending account usage of the backup server to the license server. System job sending account usage to the license server (for the redirector module). System job sending monthly meter license usage to the license server (for the redirector module). System job sending monthly meter license usage to the license server. System job sending server's configuration settings and user profiles to Ahsay. System job removing obsoleted system log ( logs > 365 days ). System job removing expired trial users. System job suspending expired trial users. System job removing obsolete files from the retention area based on the retention policy setting (for the replication module). System job performing Cyclic Redundancy Check (CRC) of replicated files. System job removing obsolete files from the retention area for all users based on each backup sets' retention policy setting. System job sending quota reminder to user close to exceeding quota limit ( when free quota is < 20% ). System job sending reminder to trial user with trial period about to be expired ( when trial period expired in < 7 days ).